We ask that parents or other designated adults personally walk their child(ren) to their Sunday school classroom and sign the check-in sheet. We also ask that parents or other designated adults personally pick up your child(ren) at their classroom at 10:20 am and initial the check-in sheet as you leave. We want to ensure the safety of each child. Our four classrooms are organized as follows. 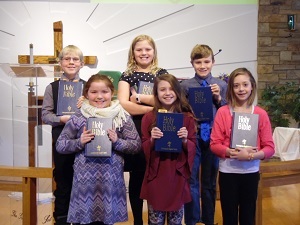 The Sunday school children presented a Christmas program entitled, “Broadcasting Live From Israel”. 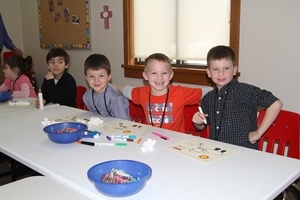 In January, third graders spent time learning about the Bible to prepare them for receiving their very own Bible. 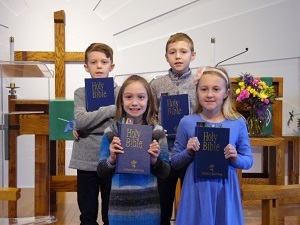 Bible presentations for our 3rd graders was held on Sunday, February 4 at both worship services.